Lentils Provençal, Thyme for Cooking vegetable sides. 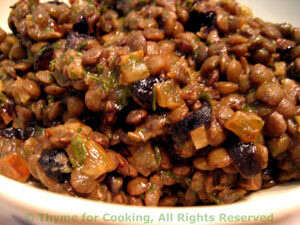 I use the tiny, green lentils de Puy, but you can use the larger brown or tan lentils. Do not use the red ones, they get too mushy. With the shallots, garlic, olives and mustard it's reminiscent of long, slow lunches in Provence. Cook the lentils in water and/or stock, with the bay leaf, about 30 minutes / according to package directions or until done. Heat oil in medium skillet over medium heat. When hot add shallots and garlic, sauté until tender, about 10 minutes. Roughly chop olives and add to shallots along with the parsley and lentils. Heat through. Stir in the mustard and serve.